My friend and mentor Mom, Carol is a fantastic cook. 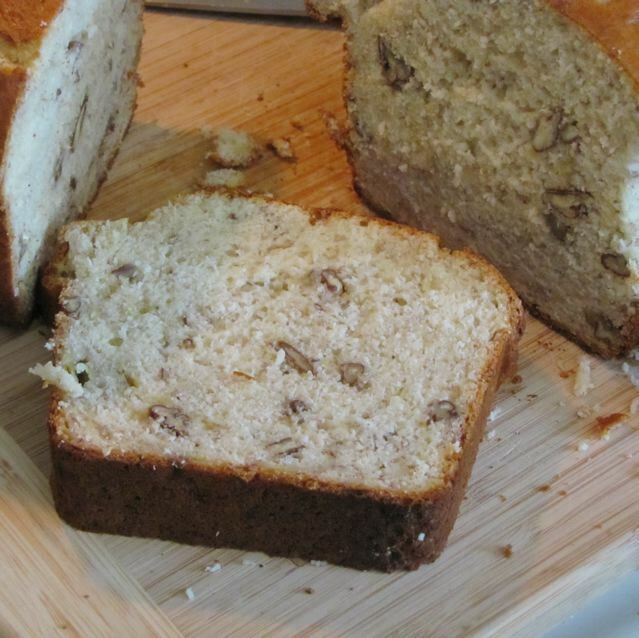 Here is an easy recipe for Banana bread that uses ready made biscuit mix to make it. It does not use any oil either, which is nice. Bake it a loaf pan. Preheat oven to 375F. Spray the loaf pan with cooking spray (or coat with butter). Mix all the ingredients together. Pour into a loaf pan and bake at 375F for 45-60 minutes or until the cake tests done, when you insert a toothpick (mine usually is done around 45 minutes). For an extra twist you can sprinkle about 3/4 cup chocolate chips on the loaf when you pull it out of the oven, wait a few minutes for the chocolate chips to melt and spread them. Allow the loaf to cool and slice into 12 slices. Yummy for breakfast or anytime. Categories: Baking, Baking - Bread, Fruit | Tags: Banana Bread, Biscuit Mix Banana Bread, Easy Banana Bread | Permalink.